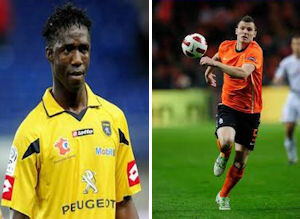 Sochaux to complain to UEFA about Toon's Maiga interest. Pardew pursues Pieters. | NUFC Blog. Newcastle United still appear to be pursuing Modiba Maiga, who missed out on his weekend league game again, and Erik Pieters, who Alan Pardew allegedly went to watch on Sunday. It seems that Newcastle think striking striker Modibo Maiga is still a plausible target despite his club – Sochaux – insisting last week that he will not be released. Maiga is alleged to have gone on strike for the game again but officially he has claimed to have a ‘pain in the knee’, although not one bad enough to warrant him seeking a medical certificate. The French press are now reporting that the deal we’re offering is €12m (£10.5m) over five years, although I find that odd as I thought Ashley wanted to avoid staged deals and preferred to pay everything up front. Meanwhile, with the increasing number of rumours linking us with Aly Cissokho, I was beginning to think that our pursuit of Erik Pieters had stalled a bit. However, if the Daily Mail is correct, the stall was only temporary and Alan Pardew himself has jumped out to give things a push start. Pardew allegedly went off to watch Pieters play in PSV Eindhoven’s match against Ado Den Haag yesterday, during which he was given the man of the match award for his contribution to a 3-0 win. The Mail suggests that Pardew is trying to ‘revive’ a £6m deal via some mouth-to-mouth with the PSV bigwigs. If the rumours about an expensive release clause in the player’s contract are true then maybe this is what needs to be resolved before we stand any chance of getting Pieters. Its swedish striker Marcus Berg in that pic. pain in the neck more like. You’re right, it was. Now corrected. Oddly, the Mail, Journal, Chronicle and Sky Sports are all using that image as Pieters too! Normally I’m not much interested in players who leave our club but I watched the second half of the match between West Ham and Leeds and it was quite sometime into the half before the commentator mentioned Nolan. Like many of our games in the second half of last season Nolan was a passenger. It looks like the Hammers now have that honour but are going to pay quite a bit more for the priviledge. On the evidence of that game, albeit it’s early days, it looks like we got the better of the deal especially having now seen Cabaye play in two premiership games. Someone mentioned he might be our next Rob Lee, let’s hope so. Pardew does deserve some credit like. We definitely play better football under Pardew then under Houghton. Nolan looked like a completely nackered old man. If he was a horse he would have eiher been put out to grass or put down by his new owners. just been thinking about cabaye and what he brings to the midfield seen him play the last two matches and ive seen that for one is up for a hard challenge (sunderland game) and does have a good shot on him but haven’t really seen anything else of course we are two games in the season and needs to adapt.Maybe playing in the deeper role with tiote will change and can be more on the attack as the season goes on,hopefully he can get into his full stride. If a team gets convicted of ‘tapping up’, doesn’t that mean the club are banned from conducting any transfer activity for a set time? I’m sure a club a few years back got banned from transfer activity? What a brilliant idea though from Ashley if it’s true. jimbob, if that’s the case,ashley will be tapping up every player under the sun,so we cannot sign anyone for two years lol. Chelsea? I think they went back on it though. Hugh, I’ve just learned that the Dutch media equivalent of “swoop” is “preys on”. Chelsea were banned for tapping up kalou or malouda from Leon. There were banned for two years but did a deal with Leon and they dropped the complaint. I doubt mike would put any cash in for a pay off so if we are found guilty let’s hope we get our players in before it pours down. Yeah it was Chelsea. I thought it was West Ham for some reason. Think I was getting muddled with the Tevez, Mascharano thing. this comment is for the one called”hugh de payen”.I’m curious to how you came up with your blog name.I am a direct decendant of Hugh De Payen and of family knights of his who fought with William the conquerer in the battle of Hastings in 1066.I’m always currious when someone is compelled to use my God given family name.I am Daniel Payen,Daniel Payen.